We’re back at it for another poll on finding the best websites on the Internet. For this week’s topic, we’re heading down childhood memory lane in exploring the wonderful world of comic books (Thanks to everyone who participated during the nomination round!). This encompasses subjects like superheroes, sci-fi/fantasy, and film/television. Get your cape on, Batman. It’s time to vote. Superhero fans…rejoice! 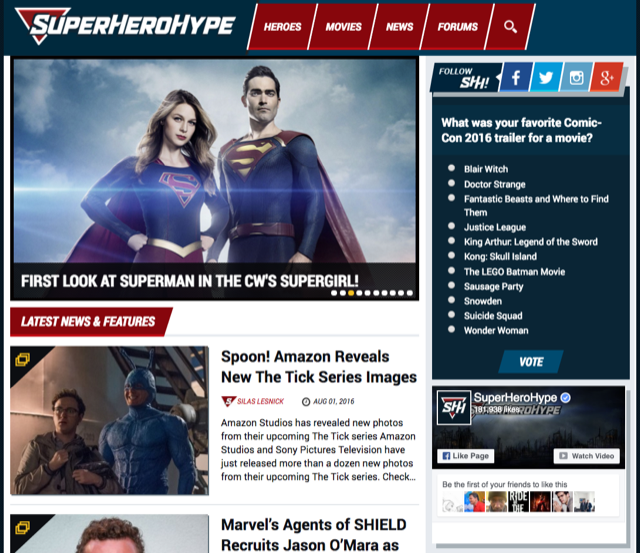 SuperHeroHype has all the latest news, commentary, and analysis on superhero movies, TV shows, video games, and comic books. Their recent Comic-Con coverage in particular was top-notch from stories such as Brie Larson being revealed as Captain Marvel and the release of highly-anticipated trailers for movies like The Justice League and Wonder Woman. Superman, Batman, Wonder Woman, The Justice League. The Joker, Lex Luthor, General Zod, Ra’s al Ghul. These iconic characters have captured our imaginations for generations and in recent years, have come to life on the silver screen with blockbuster movies like Batman vs. Superman (ducks) and the upcoming Suicide Squad. 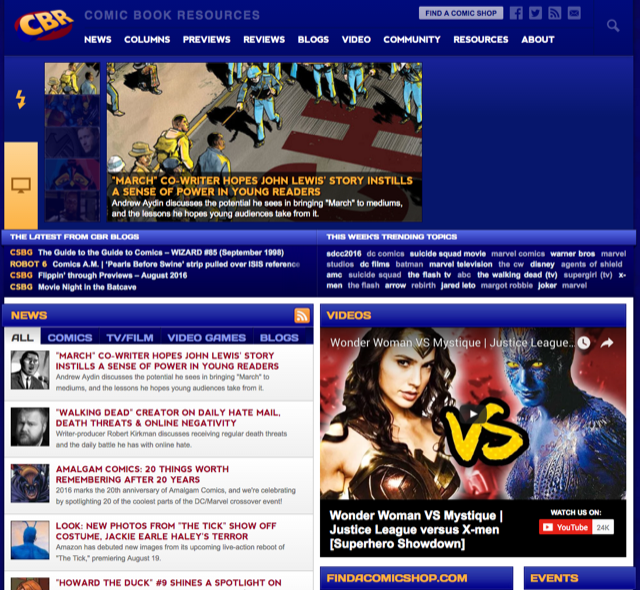 Launched in 1995 by Jonah Weiland, Comic Book Resources or CBR is one of the leading sources for comic book news and commentary. It has an active message board community where members discuss topics ranging from Marvel Comics titles like Spider-Man and appreciation threads for comic books’ most iconic characters. The site has also been recognized for awards in the past including the prestigious Eisner Award for Best Comics-Related Periodical/Journalism in 2014. 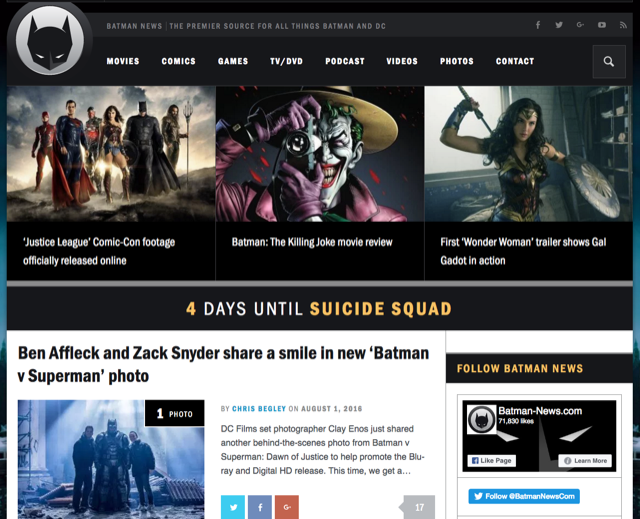 If you haven’t discovered Batman-News.com, it’s the premier destination for all things Batman and DC Comics including news, rumors, and discussions. They also publish a weekly podcast where they uncover the week’s biggest topics in the DC Universe including reactions and analysis from the recent San Diego Comic-Con. On ComicsAlliance, you can find stories on just about any comic universe from One Piece, Dead Pool, and yes, even One-Punch Man. They operate a popular YouTube channel with over 100k subscribers and their “You Think You Know” series is a great place for discovering juicy trivia about your favorite comic book heroes. The time to vote has arrived! Cast your ballot above for the comic book website you think is the best. Voting will close on Wednesday, August 10th at 8am PT. The top three sites will be announced shortly thereafter. 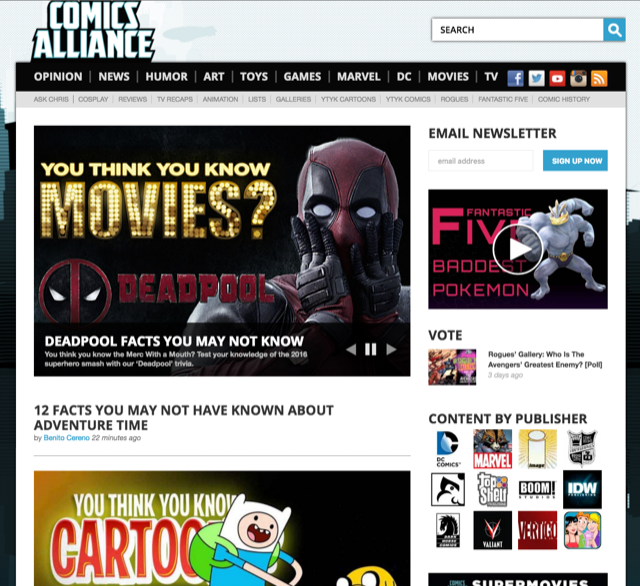 Want your favorite sites to be recognized as the best comic book site on the Internet? Help get the word out and gather more support from other readers to increase the odds of it getting featured.